Yes, Ryan photographed an extraordinary episode on a case in Redlands. A child’s toy, a small matchbox vehicle, rolled seven feet across a linoleum surface. The duration of the event was seven hours. For the vehicle to complete the distance. This would never register on the naked eye, but I have the event on the time-lapse camera. The most realistic thing in Poltergeist is the investigators’ excitement over that little Matchbox car moving by itself. In reality, assuming the floor was level and there were no other factors that might affect it, that movement would be pretty amazing – unless you believe everything you see on shows like Ghost Hunters. The truth is, anomalies don’t perform on command, and for something truly anomalous to happen while a TV crew is filming, would be truly jaw-dropping. Reality TV is entertainment, pure and simple. Oh, there’s no doubt episodes are based in true stories and experiences, but we guarantee you that real events caught on camera on a weekly series, are about as likely to happen as water turning into wine. Recently, someone asked us why nothing “big” happens in Five Nights in a Haunted Cabin, our account of our stay in an allegedly haunted little house in the woods. We were surprised by the question because we were trying our best to recount what really happened and didn’t want to exaggerate the events for the sake of entertainment. Rather, we wanted to document them. We had been given a specific duty: to investigate and report. We were not there as a TV-style ghost hunters. That’s why we went in with as little knowledge of the history of the cabin as possible. We didn’t want to have any expectations because the mind plays tricks, makes connections, and leaps to conclusions when you’ve been fed information, and that leads to inaccurate reporting. That said, we were pretty amazed by what did happen. We even conceived of The Cliffhouse Haunting during our stay and were inspired by several events we witnessed. But as far as reality goes, Tamara has spent many hours in allegedly haunted locales over the last thirty years and has been fortunate enough to witness a handful of anomalies that are pretty impressive. But the cabin was the gift that kept on giving. We saw, heard, and felt things in and around it that were peculiar – and occasionally quite frightening. While we can find possible explanations for most – if we try very hard to dig some up – we can’t explain everything we experienced. We were, to put it mildly, impressed. Compared to the ghost-of-the-week TV reality shows, our experiences are pretty tame, but from the moment we walked in, there were minor anomalies that would thrill a serious non-entertainment-oriented ghost hunter. They certainly excited and inspired us. We hope you enjoy our account for what it is – a realistic look at a “haunted” house. We admit that going back in and reliving it while we prepared it for publication gave us both the shivers, but we’ll tell you up front that neither of us levitated, spoke in tongues, or spotted any demons. However, we did experience some things that made us wonder if we’d ever agree to go back. We probably would, but we’re just crazy that way. And speaking of ghosts, don’t forget that our Gothic Horror novel, The Ghosts of Ravencrest, is available now for just .99! 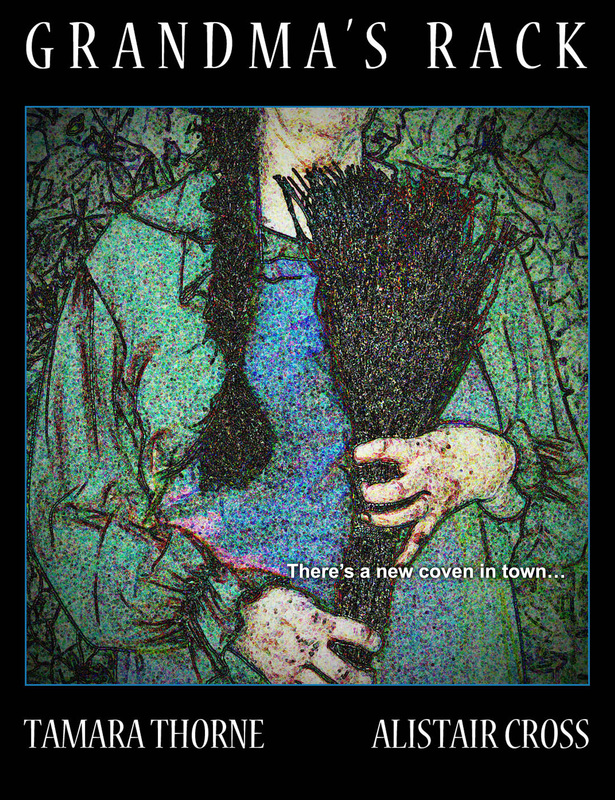 My collaborator Tamara Thorne and I were interviewed on Tales to Terrify with Sylvia Shults discussing the strange events and anomalies we experienced during our stay at an allegedly haunted cabin. We were asked to stay for three nights – which soon to turned into five – and give an account of our experience afterwards to help the owner conclude whether the place is getting a bad rap… or if it’s officially a hangout for haunts. And here is our assessment at the Lights Out podcast on Tales to Terrify. For a night-by-night transcript of our adventure, go to the Haunted Cabin links on my website. Before getting into anything else, I want to share a great joint interview I did with my collaborator – horror legend Tamara Thorne – at Gingernuts of Horror. We covered everything from horror, erotica, ghost hunting, and photography to our solo works, our process, our plans, and a bit about a future novel we haven’t discussed until now. Thank you to everyone at Gingernuts, for the fun and unique questions. Tamara and I had a good time with this one. Also, next Thursday, April 17th, at 8:00 pm EST Tamara and I have a LIVE interview at Authors on the Air with Pam Stack that we’re very excited about. I’m not especially keen on live interviews as I find any kind of public speaking worrisome, but Authors on the Air is a considerable force that you don’t say no to! The show is about an hour-long and we’re looking very forward to it. I am usually only nervous about these things beforehand. Once the show starts, I’m sure I’ll be fine, so tune in and give us a listen. It’s sure to be a good time. As soon as I have a link to the show, I will post it in all the post-able places. In the meantime, the writing is going as strong as it possibly can. Tamara and I have been spending anywhere from six to nine hours a day, five and six days a week, developing setting, establishing characters, composing plot, and polishing finished content. Our hands are full and we’re doing a bang-up job of juggling tasks, but we’re also having the time of our lives and are getting more excited every day to get our creations into readers’ hands. Grandma’s Rack is in the final stages and once the last few scenes are completed – which will be done within the week – we intend to let the manuscript sit for six to eight weeks till we can return to it with a clear perspective before doing a final rewrite. Then it still has to go to the editor, back to us for any needed modifications, then finally, to the publisher. As soon as we have it ourselves, the release date will be revealed. Belinda is plowing along and full-speed. As per our publisher, Tamara and I have creative control over the cover art for the various installments and promotional material, so for the first time, I’m putting my years of photography experience to good use. The first photo session was last weekend, and there’s another one this weekend which will include one of the male models we’ve chosen. Also, I eventually want to revisit Billy the Serpent, as he was easily one of the most natural and photogenic creatures I’ve ever had the honor of capturing with my lens… so watch for further images of him as well as his beautiful human counterparts. A great big Thank You! 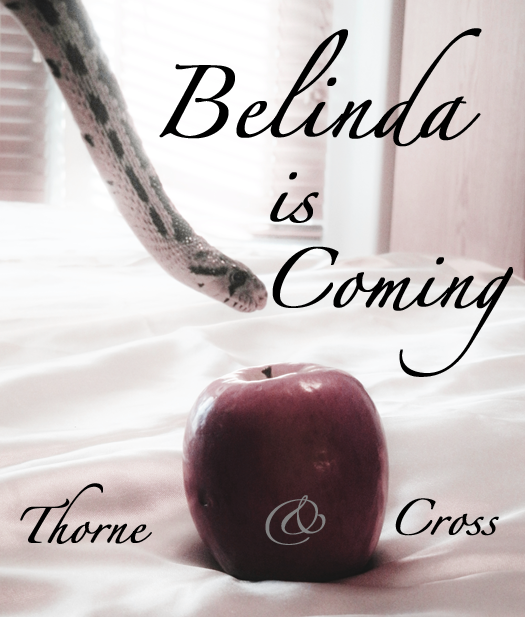 to Avalerion books for allowing us the artistic freedom to pursue our vision of the Belinda series. 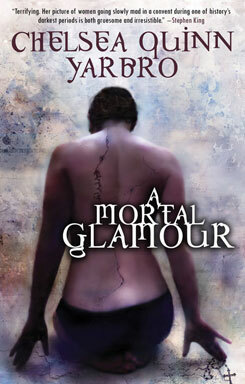 And speaking of Avalerion, I just received my copy of A Mortal Glamour by living legend Chelsea Quinn Yarbro. Chelsea Quinn Yarbro is a veteran horror author and very good friend who has several books being released through Avalerion. Between her, Gryffyn Phoenix, and Tamara Thorne, I am very good company and can’t express the gratitude I feel to be grouped with these great, great pros. Anyway, I have a lot of reading to do this summer and intend to get started on it within the next few weeks, beginning with A Mortal Glamour which I’ve already taken the confident measure of adding to my list of all-time Favorite Books. 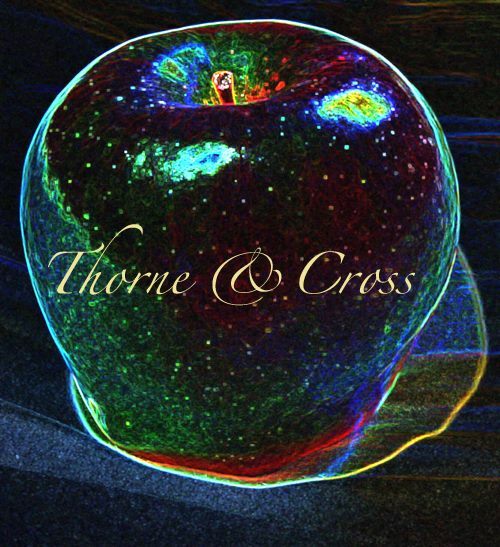 Lastly, we created a logo for the Cross & Thorne collaborations. We call it The Glass Apple and we love it dearly. You will be seeing this – and possibly, variations of this – on our upcoming projects.